As the holiday season approaches, PHR will take a look at what teams are thankful for as the season heads past the one-quarter mark. There also might be a few things your team would like down the road. 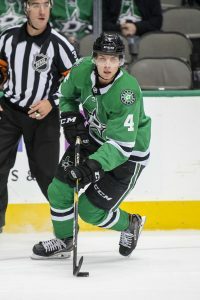 Let’s take a look at what’s gone well in the early going and what could improve as the season rolls on for the Dallas Stars. Click here for the other articles in this series. What are the Stars most thankful for? Having a top line that is among the top number one units in the league. Jamie Benn, Alexander Radulov, and Tyler Seguin have combined for an impressive 72 points in 74 games, a point-per-game rate that is even better than last season (0.97 vs 0.93). They are the backbone of the attack in Dallas and will be for the foreseeable future. Radulov has three years left on his deal after this one, Benn has six more following 2018-19, and Seguin inked an eight-year extension that kicks in next season just before training camp started. Suffice it to say, the Stars won’t have to worry about their top line for a while, a luxury many teams don’t have. Who are the Stars most thankful for? Beyond that top line, defenseman Miro Heiskanen was hyped up as a potential number one blueliner when Dallas picked him with the third overall pick back in 2017. In his first NHL season, the 19-year-old is already showing glimpses of that potential and has improved as the year has gone on while establishing himself as one of their top blueliners already; he’s averaging just shy of 23 minutes per game. Not many teams have a young franchise defenseman in their system but the Stars are one of the ones that do and he’s already making a considerable impact. That’s a huge piece of the puzzle in place for the long haul as he’s under team control for at least the next six years. What would the Stars be even more thankful for? Some secondary scoring beyond that top line. Jason Spezza has rebounded fairly well after a bad 2017-18 campaign but it drops off considerably after that. Beyond their top three forwards, no one else has more than five goals through 28 games so far this season. Mattias Janmark scored 19 times last season but has just one this year. Valeri Nichushkin hasn’t scored yet in 22 contests. Blake Comeau is logging over 15 minutes a night of ice time and has just two goals in 27 games. Getting some of these players going would go a long way towards bolstering their offense. They’re one of the top teams in the league in terms of fewest goals allowed so if they can get a second line scoring consistently, Dallas could move up the standings pretty quickly. What should be on the Stars’ Holiday Wish List? If their current depth players can’t pick it up offensively, a scoring winger will be at the top of the list before too long. On top of that, they’ll likely want to add some defensive depth given the uncertainty surrounding Stephen Johns and Marc Methot. However, cap space is limited thanks to all of their injuries on the back end so GM Jim Nill may have to wait until closer to the trade deadline to make some moves.